Kevin James talked about his new CBS show Kevin Can Wait at the TCA Press Tour. Kevin Can Wait returns Kevin James to the world of the “big guy with a hot wife” sitcoms. His last venture, King of Queens, was a massive success where it continues to thrive in reruns. Will lightning strike twice? Audiences will start to find out tonight, where the show will air following The Big Bang Theory. This time around, James plays a newly-retired police officer who discovers that the job of Dad is just as dangerous as what he had to handle on the streets. 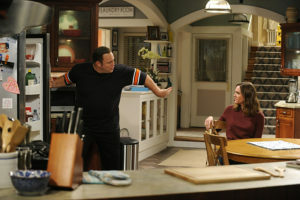 Yes, unlike his previous series… this time Kevin James plays a father. Speaking at the Television Critics Association press tour this summer, Kevin James talked about the origins of this new “Kevin” that he will be playing. Some critics might notice similarities between Kevin Can Wait and James’ previous show, but that is something the actor seems to have no problem with.